I decided to go hunting Saturday December 15th 2018. It had been raining all day and finally stopped around 3:30 so I took off to get in the stand. I saw 3 does in the bait while i was walking in so i sat down and waited for them to leave. Once they left i climbed up the tree with my climbing stand. I had been hearing a few people say they had been seeing bucks still chasing does so I figured I would give a couple bleat calls. Not long after I heard a grunt behind me and turned around and saw a doe run about 30 yards and walk back into the woods. I didnt think that I had spooked her but I turned back around and about a minute later I looked behind me again and there stood a giant with his nose in the air headed my way. I collected myself and waited until he stepped behind a tree and I stood up and grabbed my bow. He slowly stepped out into the field i was hunting and i drew my bow back. And nailed him!!! He trotted only 20 yards and fell over!!! 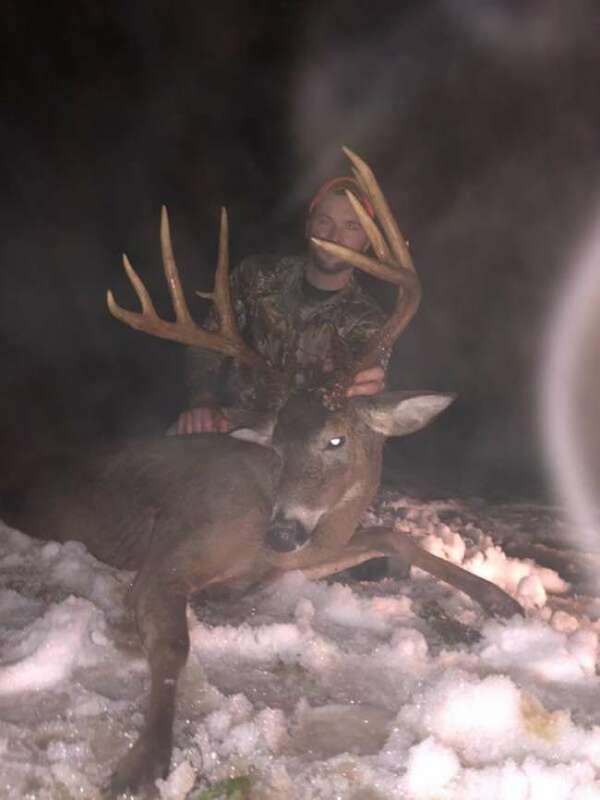 I couldn't contain myself I knew it was the biggest buck I had ever shot but I didnt know exactly how big he was until I got to put my hands on him and wow!! 14 points main frame 10. I scored him later and he ended up scoring 162 4/8.